If you prefer to read, well, keep reading, and make sure you read the whole thing so you don’t miss out on seeing the awesome bonuses at the end! I have it, so I can show you! I installed Traffic Laze a while ago, and it works just as they say it does. The person who created this software, or well, in charge of getting it created, he didn’t personally make it, is Jono Armstrong, a good friend and business partner of mine. Jono is someone who went from being unknown just a few months ago making around $50-$80 per promo..to now making $1000+ on pretty much every single promotion he does. In short, Jono is a badass, and he knows what he’s doing. Jono actually first told me about the Traffic Laze “method” several months ago. He told me he was getting 20-50 leads per day at no cost whatsoever, on 99% autopilot. 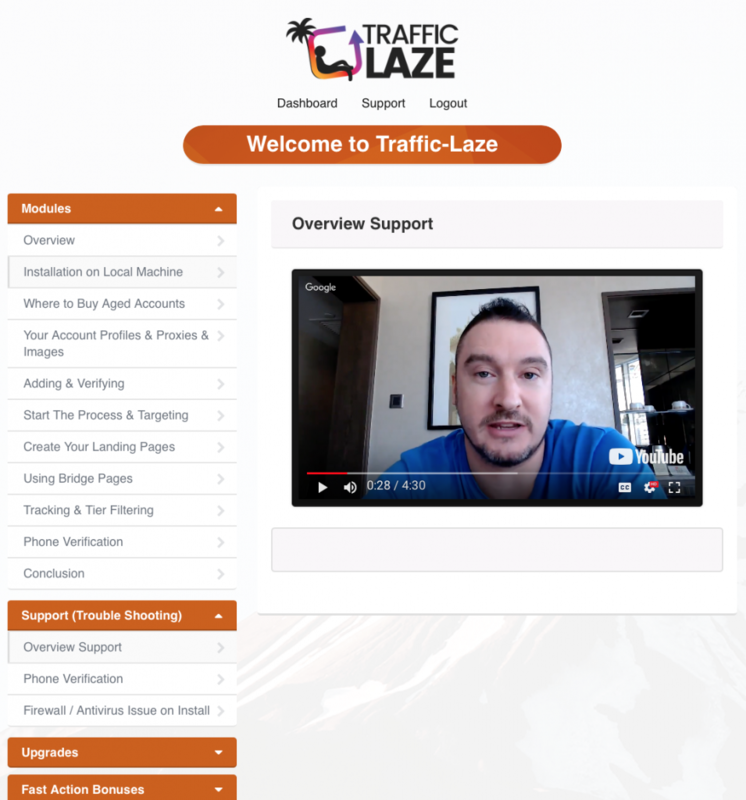 Traffic Laze Review – How Does It Work? You’re going to connect Instagram accounts to Traffic Laze. Once you’ve connected the accounts, you select a specific page/person on Instagram that you want the account you chose to follow. For example, that could be a big fitness page/person or someone in the business niche. It really doesn’t matter, you can start getting leads/sales in any niche as long as there’s buyers in that niche. Once you’ve done that, what Traffic Laze is going to do, is follow people that are following the page you targeted, using the account you chose. Some of the people that you follow, are going to check out your profile, since you’re going to choose a username that is related to the niche you enter. When they do that, you’ll have a URL on your instagram profile, that takes people to..well, whatever. How much will it cost to get up and running with Traffic Laze? If you only ever want to use 1 or 2 accounts, it will cost you nothing at all besides the cost of the software. If you want to use more accounts however, it will cost a few bucks, but very very little and i’m confident you’ll make the money back within a few days if you take action. More instagram accounts. Jono will show a website where you can buy accounts for $1/each. So if you want 20 accounts for example, that would cost you $20. You’ll then need a proxy to use to set the account up, and the proxies are also $1/each. That means you’ve spent $20 one time, and then $20/month for proxies. However, once the accounts are setup, I don’t think you’ll need the proxies anymore unless you want to add pictures etc to the profile, but that shouldn’t be necessary since all you want is people to click onto your profile anyway. I’ll double check this with Jono and will edit my review when I know for sure if you need the proxies forever of just for the one time setup, but even if it would end up costing $20/month, you’ll be making way more than that back from those accounts so I wouldn’t worry about it. (I’ve only gone through OTO1, which I think was really good. What if there was a way to scale your income much higher? With just a few simple tweaks, you can boost your profits by 5x, 10x, or even more using this advanced training! In this OTO, Jono is going to talk about list building and how you can use CPA offers to make money from. I liked this one. Sit back, relax and let Jono/Brendan/Jason do the work for you. They’ll take care of the entire setup for you and make it super simple to get started. They are going to show you how to set up Traffic Laze to run 100% automated! This opens the flood gates to organic and viral traffic working for you on complete autopilot. You can sell Traffic Laze as your own product and keep 100% of the entire funnel’s revenue. Thanks for watching my Traffic Laze review I hope you liked it! I watched your video and found it to be very informative. Thank you for sharing. One concern I have is you are required to purchase proxies. I know you will need proxies for this software in order to access many Instagram accounts. I’ve used proxies in the past and the problem I ran into was having my proxies shut down or rather the target I was using the proxies for were disabled whereby I could no longer use it to gain access which in this case would be Instagram. The other concern is getting multiple phone numbers. I actually have multiple accounts, about 4, and have not had any problems. I don’t want to use my personal accounts for this tool. But, I assume you will also have to pay for those phone numbers, which would be an added cost. To me it seems too pie in the sky. I am interested in your opinion with regard to what I have just shared with you. Also, I would be interested in seeing how you set up this software and how you are using it. Sorry for making this too long, but I’ve paid for tools using proxies and multiple phone numbers only to have them shut down. I haven’t heard anything from Jono about having any issues with his proxies, and it is my understanding that you’ll only need the proxies once, and once the account is setup, you don’t really need the proxy anymore. If you do and you no longer have a working proxy, you should be able to just buy a couple new proxies. Worst case scenario, Instagram will ask you to re-verify your account, but the cool thing is when you buy from the source that Jono recommends, you actually the original email used to sign up for the account as well, so you’ll be able to verify the account again. As for phone verification, I can’t remember what Jono said to be honest, but he did have a way for getting around that as well. There was some kind of app that he used, I am not sure how much it cost, but it would have been very little. I’ve been super busy this weekend but I will definitely be setting this up within the next couple of days. Thank you Jonas for responding to my message. Skulle det t o m funka med svenska konton och sökord på instagram tro? Hej Inga-Lill, det tror jag absolut att det gör! Ser ingen anledning till att det inte skulle fungera. Det vore ju toppen. Tack för svar! Fråga; om man sätter upp programmet med t ex 20 konton, kan man marknadsföra 20 olika saker/länkar? Borde ju gå i o m att länken ligger i respektive profil, men postar man några inlägg över huvud taget med programmet, eller får man göra det manuellt eller ev med nåt annat software i så fall?